One of the most powerful features EfL has to offer is that you can add ANY framework with which to capture evidence against and track progress for. A framework can be a comprehensive national strategy, your own ‘I can’ statements or assessment criteria, or individual learning outcomes designed to meet the needs of an individual learner. Watch the 5 minute video below to see a walk-through example of how to add a framework or build and add your own assessment criteria. The video was recorded using EfL version 4.4 on a device using Credits (Pay As You Go), it works the same if you have a ‘Stand-alone’ Subscription or a Trial Subscription. 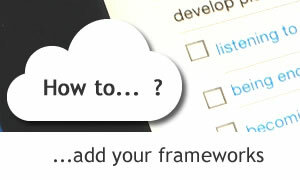 If you have a Cloud Subscription then use the Console to Add Frameworks or the PLGs for Personalised Intentions that can adapt over time. For more information on frameworks and using the app with your assessment criteria and learning targets, please visit the “Frameworks” section in our online Help Center. Tutorial: Learn how to add your own framework to EfL - whether thats a comprehensive national curriculum, 'I can' statements that you have developed or learning outcomes designed to meet the needs of an individual learner.